Many blocks got done on the honey comb quit. I worked hard to sew a few more blocks. 6 more med fabric blocks and one more dark block. I think I am doing 2 of these quilts. One with the multi fabrics and one with the rainbow colours, like the red ones I showed last week. edit: I have been asked to link to the Honey Comb Pattern, I had done it last week and forgot today. The blocks are made up of strips 1" to 1 1/2", but most are 1 1/2". You can see there are so many different fabrics in each block. I raided all kind of scraps. I have many boxes of scraps that have not gotten a good sorting. Boxes like this one. I took out the good colour strips years ago but left these as they did not fit in a colour. So this month we dig deep to pull them out and use them. 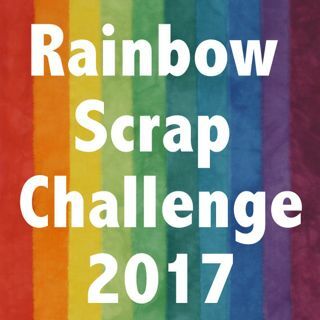 I have added this post to Soscrappy and the Rainbow Scrap Challenge 2017. She is our leader in all this colour madness. Strips sewn together and ready to be ironed. I have Hawaii fabric, Floras left over from doing water colour quilts, stripes, kid's prints, some golden oldies from 21 years back or more. I had to show you. I filled all the bobbins in my machine last week. I did so much sewing I emptied 8 plus the one in the machine - so 9 bobbins. That was a lot of sewing! I really love these blocks done with the multi coloured scraps. I agree that making a quilt with just these fabrics will look amazing!! I think these are my favourite multi coloured blocks yet. Pattern link, please. Love, love, LOVE the way your blocks are coming together!!! Those blocks are gorgeous! Love all the fabrics. I also like the pic and note of the details with the empty bobbins. I like to gauge my work by how many bobbins I go through! Love your blocks. I had not seen that honeycomb pattern before this, and it looks great with all the variety of fabrics. Sometimes it's the sorting of all the scraps that bogs me down. You've done great, and made so many blocks!